They say a watched pot never boils. This is, obviously, just an Olde Wyfes’ Tayle, but it demonstrates that old wives had a surprisingly sophisticated anticipation of the Copenhagen interpretation of quantum mechanics. Still, there are tayles and then there are tailes. So what if it’s a feline observer doing the watching? The theoretical mystery of Schrödinger’s Cat provides no clear answer, so more empirical evidence is needed. We had pasta for dinner last night, which provided us with an ideal test bed to answer this question once and for all. 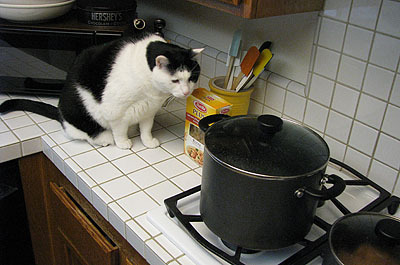 Here’s the answer: as long as Inkblot was watching our pot last night, it didn’t boil. A little later he got distracted by some Cosmic Catnip, and the pot boiled. So even if you have a brain the size of a peanut, you count as a quantum mechanical observer of the universal wave function. Science marches on.